Mexico-Argentina Trade Agreement Signed, U.S. Farmers to Lose Billions-Truth! & Fiction! - Truth or Fiction? Mexico and Argentina have reached a trade agreement that enables Mexico to import wheat, corn, rice and soybeans from Argentina in response to President Donald Trump’s hardline approach to diplomatic relations with Mexico. Mexico and Argentina reached a trade agreement in October 2017 that enables Mexico to begin importing Argentine wheat. However, various sources have misreported Mexico’s motivation for signing the trade deal, the terms of the Mexico-Argentina trade agreement, and its impact on U.S. farmers. Although a real trade deal is at the heart of this rumor, however, various claims made about the deal aren’t accurate. These claims confuse earlier trade deals with the wheat deal reached in 2017. These claims also overstate the potential economic impacts of the Mexico-Argentina trade deal by incorrectly citing a study on the total economic impact that the complete demise of the North American Free Trade Agreement (NAFTA) would have on U.S. agricultural markets. Finally, the motivation for the trade deal is also misstated. Reports that Mexico and Argentina were pursing a trade deal first surfaced in early 2017. Reuters reported in April that Mexico had been seeking to diversify its trade portfolio ever since Trump’s election. Other sources made more specific claims. One heavily-trafficked meme in particular alleged that the Trump administration was trying to distract attention away from the deal because it demonstrates that “Mexico retaliated against the border wall” that Trump had promised. A meme makes a series of incorrect claims about a Mexico-Argentina trade agreement reached in October 2017. 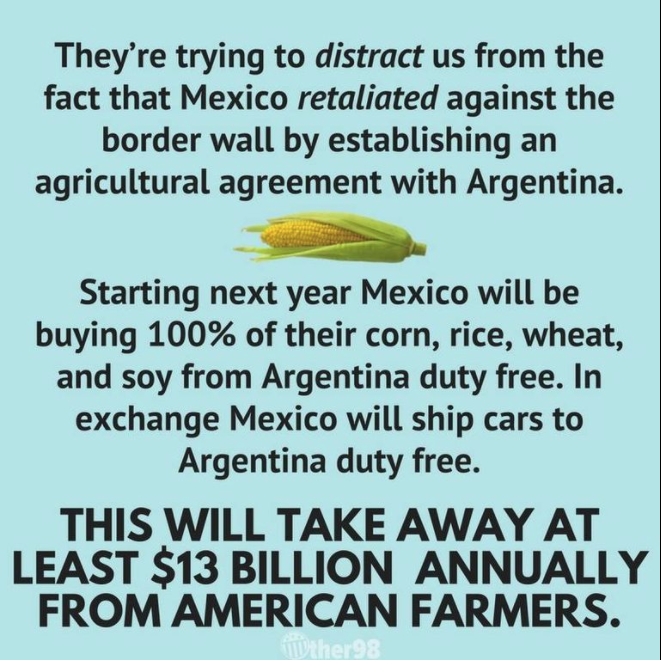 The meme came from a left-wing Facebook community group called “The Other 98%.” It claims that,”Staring next year, Mexico will be buying 100 percent of their corn, rice, wheat, and soy from Argentina duty-free.” In exchange, Mexico could ship cars to Argentina duty-free. The Mexico-Argentina trade agreement would have a $13 billion negative economic impact on American farmers, the meme concludes. Milling industry contacts indicated that they first requested approval for Argentine wheat three years ago, and have also requested access for wheat from Germany, Poland, and Australia. This is part of an ongoing strategy of ensuring Mexican millers have access to the best price and quality combinations for wheat on the world market. The election of Argentine President Mauricio Macri in 2015 likely helped spur the Mexico-Argentina trade agreement. Macri campaigned on a free-trade platform. And, aside from Argentina’s willingness to forge trade deals, the USDA FAS report notes that, “current purchases take advantage of competitive pricing of Argentine wheat versus U.S. wheat at this moment in time.” The report also notes, however, that Trump’s pledge to renegotiation NAFTA had also been a contributing factor. In the end, Trump’s hardline stance on renegotiating NAFTA contributed to the trade deal. But external diplomatic and market forces weighed just heavily. And the meme’s claim that Trump’s border wall is to blame isn’t supported by the facts. The trade agreement reached between Mexico and Argentina in October pertained only to wheat imports. References to Mexican corn, rice and soybean imports stem from earlier (credible) reports on trade deals between Mexico and other South American countries. Earlier in the year, Mexican livestock producers negotiated deals with corn producers in Brazil. U.S. corn exports to Mexico, which totaled 13.8 million metric tons in 2016., would take a hit as a result. By July 2017, Bloomberg was running disturbing headlines like this one: “Mexico no longer No. 1 buyer of U.S. corn after trade tensions.” Mexico had plans to import up to 5 million metric tons of corn from Brazil in the medium- to long-term future, an official said. Further talks pertaining to rice imports were ongoing at the time. Given that the U.S. exported 13.8 million metic tons of corn to Mexico in 2016, however, the idea that Mexico would import “100 percent” from countries other than the U.S. is false. The 5 million metric tons from Brazil wouldn’t even account for half of Mexico’s total demand. U.S. farmers and farm groups have voiced concerns about agricultural trade developments with Mexico over 2017. But, again, those concerns aren’t the result of a single trade deal between Mexico and Argentina. Claims that Mexico’s trade deals would have a $13 billion negative economic impact on U.S. farmers are based on a letter sent by farm groups to Commerce Secretary Wilbur Ross in October 2017. Warning against the dangers of eliminating NAFTA, the letter cites a study by ImpactECON study that found “a drop in GDP of $13 billion from the farm sector alone” would result from NAFTA’s demise. However, the $13 billion figure identified in the study refers to the economic impact of the total demise of NAFTA — not one or two trade deals. For that reason, the potential economic impacts of the Mexico-Argentina trade deal have been dramatically overblown. New Jersey's First Muslim Mayor Vows to "Glorify Allah" in Every Decision-Fiction!